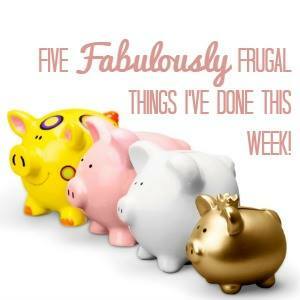 Welcome back to Five Fabulously frugal Things I’ve Done. This is easily my favourite post of the week to write. I always feel like giving myself a celebratory clap on the back for being frugal! Today is the biggest sale of the year in my eyes, the Boots 70% off and later today my new vlog will go up sharing my bargains. I am writing this post before I go but I am genuinely excited to see what bargains I can get! You really need to be on the ball with this sale and I shall be there ready for opening time! I have written up my post on the Btox Challenge and I’m pleased to say that I am doing well. I have been much more mindful of my incidental spending. I have started running again, I ditched the gym membership a while back and I am running outside. I am also doing a couple of classes which I pay for in advance. This makes sure I attend. Running outside feels so much better than on a treadmill too. Plus I get to breath fresh air! I have done a little sale shopping that is things to put away for birthdays and so on. I managed to get Dyl a Timberland T Shirt from £30 to £10. It has been put away until his birthday next month. Our puppy Lilly is on heat at the moment and I needed some puppy pads because she sits on our sofa. However, these are quite pricey for what they are! Erin had outgrown some tights and put them in the bin. I have recycled them by cutting them down and just putting them on Lilly in the evening! I learn something new every day! Didn’t know about that puppy and heat bit. Anyway, it’s nice to read of someone who didn’t chicken out on going outside to get some exercise this week! It was wee cold for me so my pocket will feel it later on in life if I’m not careful. Thanks for sharing and for allowing me to share too!